You've all seen this Block of the Month I've been working on for what seems like the entire year. Well, I guess I really have been working on it all year seeing as how it was a Block of the Month - lol! The shop that sponsored it closed after the 3rd month or so. I decided to have the remainder of the blocks sent to me all at once and managed to finish it late this summer. It's been a thorn in my side for one reason and another. I was going to try custom quilting it, but in an effort to move on to something else because I'm a finish-what-I-start kind of gal, I decided to use a pantograph. I have about 4 or 5 more rows to go. 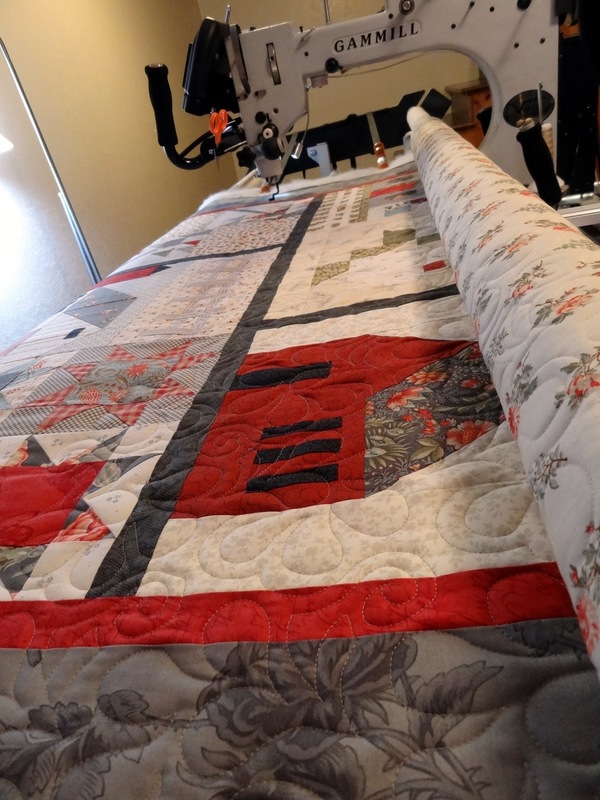 I call it "Quilting From the Back Seat" because I use the back of my machine and follow the pantograph with a laser rather than standing at the front. You can click any photo to enlarge. I chose a tan thread for lack of any other idea of something that would blend with the gray, red and cream and was totally surprised at how well it works! With any luck I'll just make it to the end before this spool runs out, too! 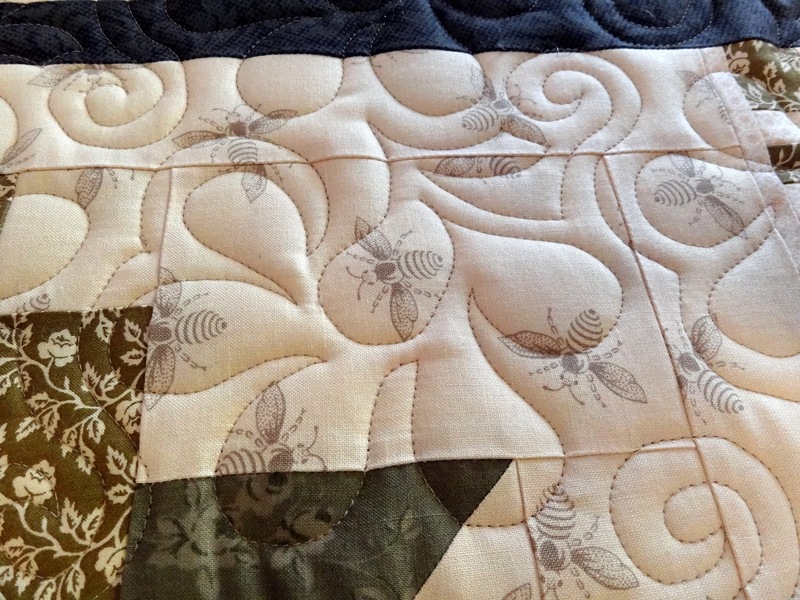 Here is a closeup of the quilting design. It's one of my favorites! We had a lovely Thanksgiving with Otis and Teresa who drove up from John Day, Oregon. Otis is the fellow who married us! 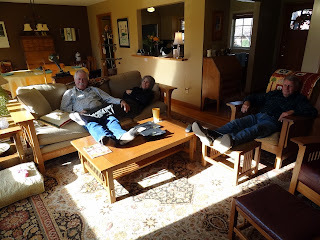 Look how relaxed they are along with Mr. Squash, and we hadn't even eaten yet! After Thanksgiving Mr. Squash and I did a little antiquing. I found this great Bakelite "pickle" fork which matches my set of Bakelite. I've also been wanting a needle threader that works with my long eyed needles - score! 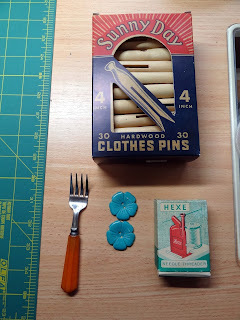 Cute buttons and something I've searched high and low for - vintage clothespins in their original box! They don't even look as though they've been used! This weekend I'll be decorating for Christmas. Come back in a few days and I'll take you on a tour around the house! I can see why that quilting design is a favorite. Looks like soon you'll have an evening of hand sewing then a good snuggle under your beautiful new quilt. Did the guys go in a horizontal position after the big meal? Great vintage score. 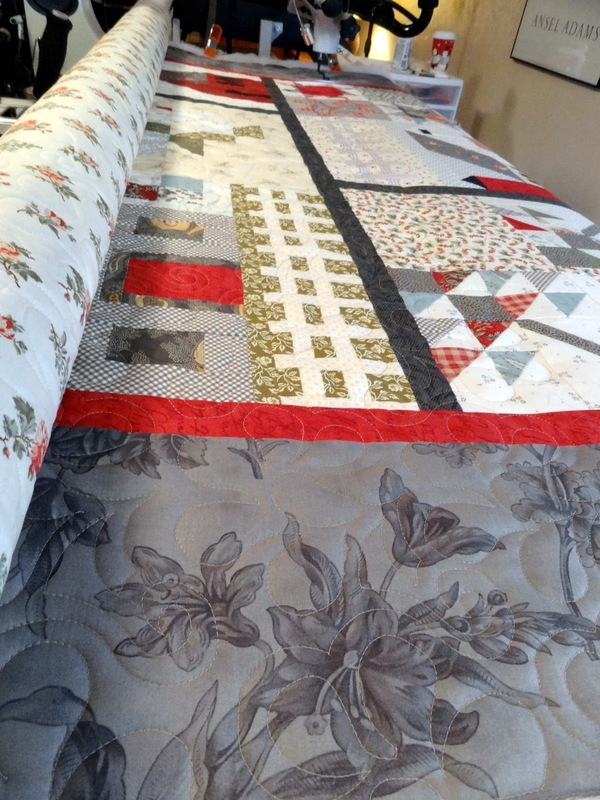 It's a gorgeous quilt and I love the pantograph you decided to use with it. The clothes pins look brand new! It sounds like you had the perfect holiday with friends! Great choice for a panto, Candace. You are going to show us the entire quilt when it's done...right? Can't wait to see your house decorated for Christmas! DO hurry! Candace, you're quilting looks amazing! Can't wait to see the finished quilt. It's a good thing when friends can get comfortable in your house! That quilt sure looks beautiful! What an exciting project. Good luck finishing it. Great finds. We're decorating today too. Tradition. We used to make little dolls from that type of clothes peg when I was a child. I love the quilting design you're using and am looking forward to seeing the whole quilt when it's done. Great score on the vintage stuff,and even better... you gave me one of the needle threaders! I can sew again!!! P.S. Love the quilt! Beautiful colors. OH, too bad you haven't really enjoyed making that quilt. I really like it though. I do like that design too. Well, I think your friends look like they feel at home. long. I am now quilting it on the Gammill. Hope to see your finished quilt. Sorry that the BOM ended up being such a nightmare for you. The quilting looks beautiful though. Thank you so much for your comment on my quilt. The sunset Photo shoot was so much fun. Living in a beautiful area and having a quilt made for sunsets made it all work!